Greenleaf Book Group Press, 9781626342149, 240pp. NEW YORK TIMES BESTSELLER "The Sustainable Edge: Fifteen Minutes a Week to a Richer Entrepreneurial Life" was written for business owners who are seeking a fuller, more rewarding work-life balance. In this easy-to-reference, practical guide authors and entrepreneurs Ron Carson and Scott Ford share personal anecdotes to their own career successes. Each chapter is designed to inspire entrepreneurs to define and sustain a competitive edge in the complex, fast-changing world of business. Relying on insights and proprietary tools based on decades of experience, the authors teach you how to achieve your goals across four key areas: your business, your teams, your clients, and your personal lives. In this book you will learn the authors trademarked Business Implementation Quotient (IQ) Grower process that appears in the form of end-of-chapter exercises. These easy-to-perform exercises can be completed in as little as 15 minutes per week to help your company boost its own Business IQ. 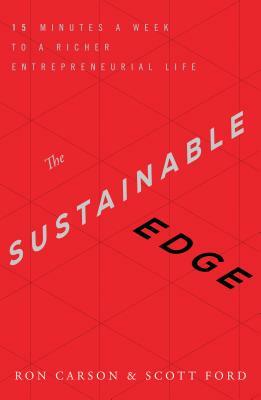 This work is an important read for entrepreneurs in search of achieving the sustainable edge in their careers and their lives. Ron Carson is the founder and CEO of Carson Wealth, one of the largest wealth advisory firms in the country, serving clients through holistic financial planning, disciplined investment strategies, and proactive personal service. He is one of the most celebrated and respected financial advisors and executives in the industry and is a sought after speaker, thinker, and investment strategist. Ron has shared his success principles, as documented in his book, "Tested in the Trenches," with audiences worldwide. Most recently, Ron coauthored "TheNew York Times"best-selling book "Avalanche" and the blueprinting process that goes with it. Together, these tools help advisors learn how to clarify their mission, vision, and values by setting business and life goals. Ron and his wife Jeanie reside in Omaha, Nebraska. Scott Ford, founder and CEO of Cornerstone Wealth Management Group and a Carson Institutional partner, serves on the investment committee as the technical strategist. He is a registered principal at LPL Financial and is a registered financial consultant. Scott is ranked in the top 1 percent of all LPL registered financial advisors. He was recognized as one of the 20 Rising Stars of Wealth Management by "Private Asset Management Magazine." Scott is the author of two books: "Financial Jiu-Jitsu: A Fighter s Guide to Conquering Your Finances "and" The Widow s Wealth Map: Six Steps to Beginning Again." Scott and his family reside in Hagerstown, Maryland."